The Godiva Bunny is available in milk and dark chocolate variants while Godiva Mini Eggs consist of a selection of eight filled eggs coated in Belgian chocolate. This collection includes Milk Chocolate & Salted Caramel filled, Dark Chocolate & Coconut filled and White Chocolate & Praline filled eggs. “We already have a strong year-round presence with our core range of Godiva products,” said Sarah Horowitz, director of the new ventures business unit at pladis UK&I. “However, Easter presents a key sales opportunity, with chocolate sales boosted by £292 million in 2018. “Following strong consumer appetite – and a 3.9% growth – in premium chocolate last year, we’re excited to bring two new luxurious and seasonal products to market in time for Easter 2019. Godiva Bunny Milk Chocolate and Dark Chocolate will be available in 100g packs for an RRP of £4.00, while Godiva Mini Eggs will be available in a 90g box of eight eggs for an RRP of £5.00. 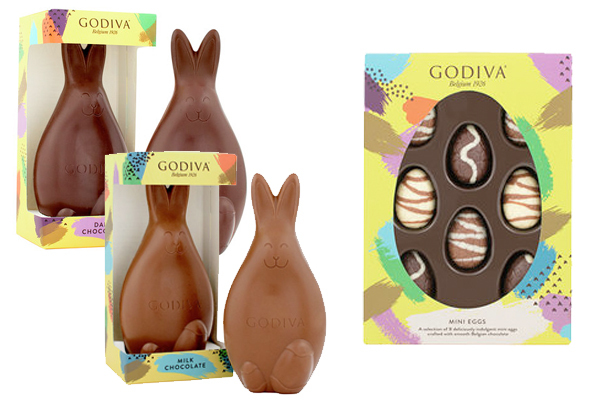 Attractive Godiva Easter Range from Pladis for this Easter. Eye catchy and mouthwatering chocolates range from the World’s Best Chocolate Suppliers and Distributors.